Since this is an election season, the newspapers have been filled with promotions of ocean desalination as the “silver bullet” for resolving our water shortage. Supporters of desalination include Jordan Cunningham, Adam Hill, Richard Waller, and others. Citizens and voters should be aware, however, that desalination is always an expensive proposition, and Diablo Canyon desalination is no exception. 1. PG&E, as it repurposes Diablo’s desalination plant infrastructure after decommissioning its nuclear power plant. 2. Water wasters, most of them groundwater users, who get water at a much lower cost and won’t be paying for desalinated water. 3. Developers taking advantage of the opportunity to build without addressing the challenges of drought-related restrictions. 1. Marine ecosystem from desalination intake and outfall. 2. Local energy supply, because desalination is energy intensive. 3. Urban water users, who would pay the bulk of project development, implementation, and distribution costs. For every two gallons of ocean water intake, approximately one gallon is waste. After 2025 (Diablo’s projected decommissioning), the discharge from Diablo’s desalination plant won’t be mixed with billions of gallons of power plant discharge. So the salinity of the ocean discharge would be much higher than it is now. The plant’s intake, the outfall, the technology of the plant, the public distribution, and the sites for all of the infrastructure would need upgrades, new permits, design, and construction. The permits would need to come from the State Lands Commission and the California Coastal Commission, among others. At any point, the regulating agency could ask for CEQA environmental review and inquire as to whether better alternatives are available. Most of the time, conservation and/or reclamation are superior to desalination. A recent article summarizes the challenges and elevated financial costs of ocean desalination here. Furthermore, Diablo Canyon’s desalination project is unique, as it faces more challenges than other “desal” projects. Specifically, the ocean outfall is near a marine protected area (at Point Buchon). Studies would be necessary to show how marine life would be affected by the increased salinity from the desalination plant’s outfall. Also, a health study would be needed to show whether distribution of water from the Diablo Canyon Nuclear Power Plant site is safe for the environment and the community. Given the existence of other, better alternatives, the empty promises of Diablo Desalination are without merit. Desalination primarily benefits special interests, including developers, while negatively impacting the environment and residents. If you are an urban water user, you should question whether Diablo desalination is a viable solution or simply a ploy. We ask the community to support leaders who are instead committed to common-sense conservation solutions, including water reclamation. 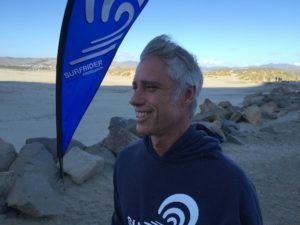 Brad Snook is the Surfrider Foundation Program Coordinator, Know Your H2O. The Surfrider Foundation is a grassroots nonprofit environmental organization dedicated to the protection and enjoyment of oceans, waves and beaches through a powerful activist network. Just build the pipeline from the mouth of the Columbia river, underwater to Northern California. It’s been talked about before. Water desal is a fight against the big water corporations that want to dictate to the people that we have to pay their price for drinking water. Sorry yahoo’s, the ocean is everymans faucet and since desal is an easy, modern day fix for a never ending faucet, we need to tell the lobbyists to go to hell because we’re going to turn the spigot on and leave it on with an almost inexhaustible source of water that no other man or business can keep us from tapping. OK, the election is over and the dems still hold the super majority in CA. Question: What have they done while holding this super majority for the past decades, to provide additional electrical power supplies, additional water storage capacity, additional reliable sources or drinking water? Too many hands sticking out asking for free freebies to focus on the actual taxpayer. We need to continue our outrage at our elected officials for always pandering to the lowest common denominator. Does anyone else think that letting all our water run out to the ocean and then use a very expensive, energy intensive process to turn it back into freshwater crazy? Deal is out, we need more capacity to store water. Don’t believe politicians who offer up solutions that they know will not come to fruition. Dump Erik Howell, he is sick and corrupt.